As children, pretty much everybody dreamed of flying, of possessing some type of hidden power that could be used to protect and save loved ones, even the entire world. Somebody once said that from great power, however, comes great responsibility, but children hardly think about something as boring as this. Now that many of these children have grown up, it’s time for them to experience what it means to be an all-powerful being with Megaton Rainfall, a game that does a very good job in making players feel like true superheroes. Megaton Rainfall’s premise is incredibly simple: a higher being has transformed the player, presumably a common human, into a powerful individual able to soar the skies, shoot energy blasts, stop time and so on. With these power, the hero has to prevent the Intruders, an alien race, from invading Earth. These Intruders are made more powerful by the Xenospheres, mysterious objects granting extraordinary powers. By recovering Xenospheres, the higher being will reveal more about himself, the nature of the universe and the purpose of the hero’s existence. 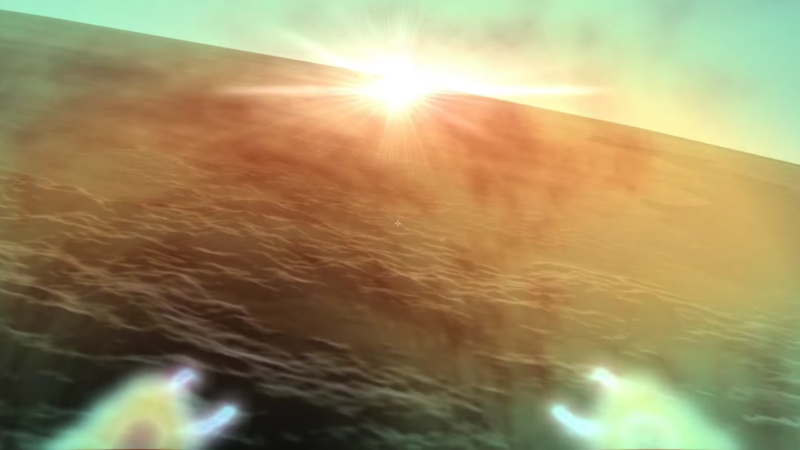 Megaton Rainfall’s story is narrated by some simple sequences where the higher being talks to the hero directly, with subtitles artfully popping on screen. There are no true cutscenes, but the way narration proceeds after each mission makes the whole game quite engaging, as it is told in a way that leaves players hungering for more. The story also touches on some very interesting themes. 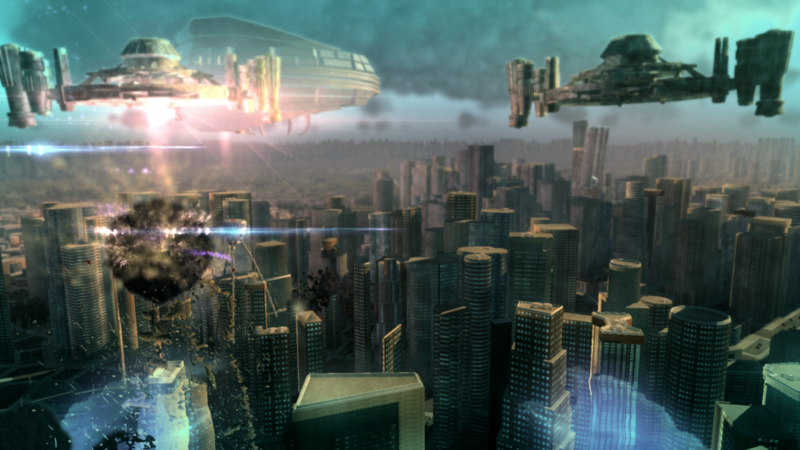 Megaton Rainfall’s gameplay experience is just as simple as its storytelling style. Played from a first-person perspective, players are able to fly all over the Earth and even through space while not engaged in a mission. The hero’s basic attack is a damaging energy blast that can take down the most basic enemy ship in just a few shots. Some of the smaller enemies and all of the bigger ones have one weak spot, marked by a red light, which must be attacked to deal significant damage. While the experience basically boils down to destroy all enemies to win, Megaton Rainfall manages to feel fresh even after hours thanks to the good variety of enemies included in the game. Even though the hero cannot be harmed, missions can still be failed if the number of casualties becomes too high. And here comes one of the most interesting features of the game: energy blasts shot by the player can cause quite a bit of damage to the city, so being as accurate as possible is the key to success. Something that’s easier said than done, as enemies are quite mobile and it’s easy to miss a shot. While the basic Megaton Rainfall experience doesn’t change much during the 4/7 hours of the main campaign, there are a few features that make it feel fresh from beginning to end. Alongside the already mentioned enemy variety, players will also receive new powers constantly which, coupled with the new story details provided between missions, makes it so that completing a mission is quite rewarding. The difficulty isn’t particularly high either, so those who just want to play the game to try out new powers and learn more about the story won’t have too much trouble doing so. Those wishing to be the perfect heroes can also try to get a perfect mark at the end of each mission. Megaton Rainfall’s presentation isn’t exactly the best at first glance, but it definitely feels better with time. Cities, which are semi-procedurally generated, and the overall terrain don’t look particularly detailed, but as players will be moving at high speeds most of the time, it’s easy to forget about it. Performance, thankfully, is quite solid, with the game running smoothly even during the most hectic of sequences, so the super-hero feel is nicely represented. Music and voice acting also do a decent job in making players feel immersed in the game’s world. Additionally, the game is PSVR compatible, so those who have purchased Sony’s headset will be able to truly feel like a superhero. Megaton Rainfall’s true strength lies not only in its simplicity, but also in how it tries, and succeeds, in doing something different. The game isn’t particularly long, but it manages to keep players entertained during its short length with gameplay variety and a story that offers plenty of food for thought. A stylish and unique take on the arcade shooter genre that no fan of the genre should pass on, as those who like to try something different shouldn’t as well. After all, it’s priced at a mere $15.99. Megaton Rainfall is, in more ways than one, the perfect superhero simulator, making players understand that special powers can do way more harm than good. With a short but very sweet campaign, an engaging story, and a good gameplay variety, Megaton Rainfall is a new take on the arcade shooter genre that no fan of the genre should pass on.